I know it's early, but Purim is coming on March 24 and you don't have to leave it to the last minute to get ready. 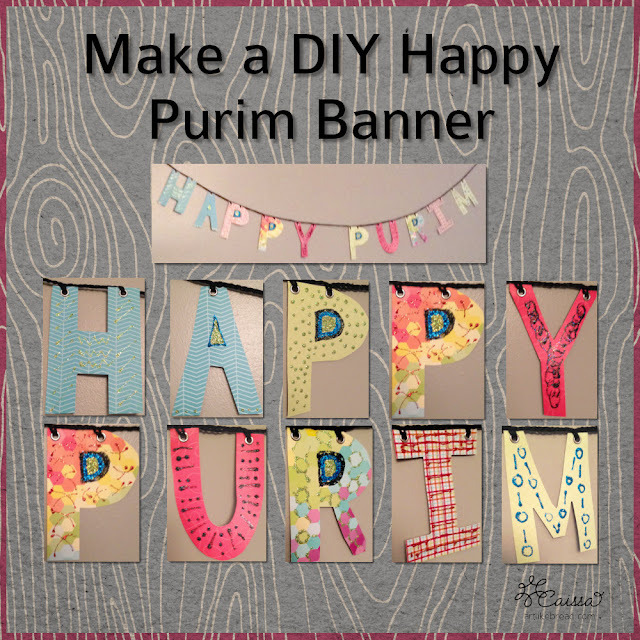 I made this Purim banner in just a few hours and it's really cute. 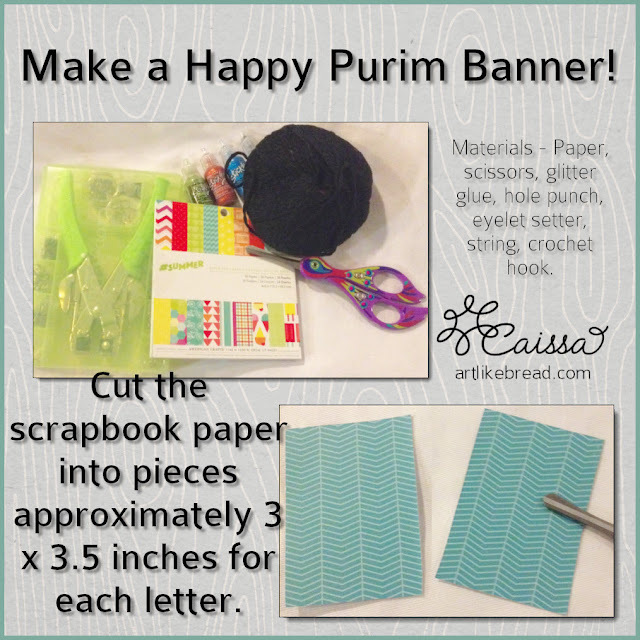 You can also use the techniques to make a banner for anything! Mouse over the image to share on Pinterest! Materials: scrapbook paper (or other pretty paper), glitter glue, string, scissors, hole punch. 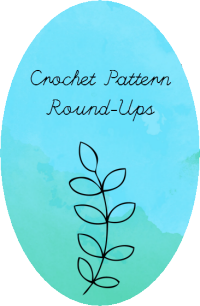 Optional: eyelet setter, crochet hook. 1. Cut the paper into pieces that are about 3 inches by 3.5 inches. You will need as many pieces as are in your message. 2. Cut out the negative space for each letter. Look at the picture. For "H", I just cut out a rectangle on the top and on the bottom. If you need guidance, look at your keyboard to see how the letters should be shaped. 3. Punch out holes in the tops of your letters (and set eyelets). If you use the hole punch/eyelet setter that I use, you can set the guide so that your holes are evenly spaced. 5. Let these dry thoroughly for a few hours. (You can speed up the process by using a hair dryer or a heat gun!) Mine dried for about 8 hours overnight. 6. Arrange the letters in the right order to spell your message and string them together. 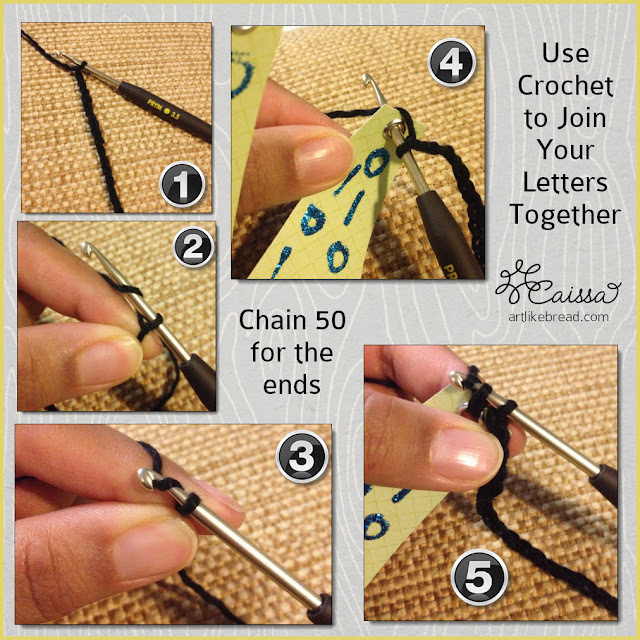 Use knots to secure your letters so they don't slide around. Use crochet to join the letters together. 1. Arrange your letters in the order you would like them in your banner. 3. 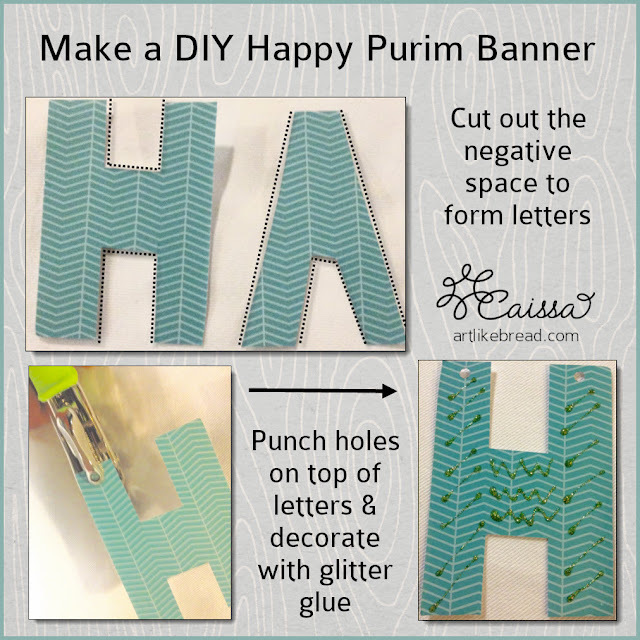 Working right to left, from the last letter (example, from the right hole on the "M" in "Happy Purim"), single crochet through the eyelet. 4. Chain enough to make it to the next eyelet without too much slack. Yet, too much slack is better than too little. 5. Single crochet into the next eyelet. 6. Chain about 6 or 8 (keep this number consistent throughout) to space between the letters. Repeat steps 3-6 for each letter. DOUBLE the number of chains for spaces between words. After you have crocheted through the final eyelet, chain 50 and tie off. 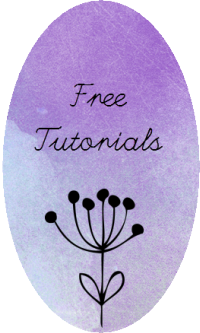 If you would be interested in learning how to make a banner like this or buying one from me, please let me know by leaving a comment or contacting me at artlikebread (at) gmail (dot) com. As always, thanks for reading the blog! Please leave your thoughts, ideas and questions in the comment section below. If you liked this post, please share this post with a friend through social media & break out the scissors and glitter! Like my Facebook page for updates and more crafty sharing!